Reconstructed border crossing Bajmok has been opened today. It is one of eight border crossings between Serbia and Hungary whose reconstruction cost EUR 2.1 million, done according to the highest global standards. The opening ceremony was attended by Minister of Finance Siniša Mali, Head of EU Delegation Sem Fabrizi, Assistant Minister of European Integration Branko Budimir and Director of the Customs Administration Miloš Tomić. Branko Budimir recalled that the EU allocates significant amount of grants for activities that are part of Chapter 24 - Justice, freedom and security. Over the past years, the EU has invested EUR 50 million in integrated border management. In addition, the EU allocates funds for cross-border and transnational cooperation projects. 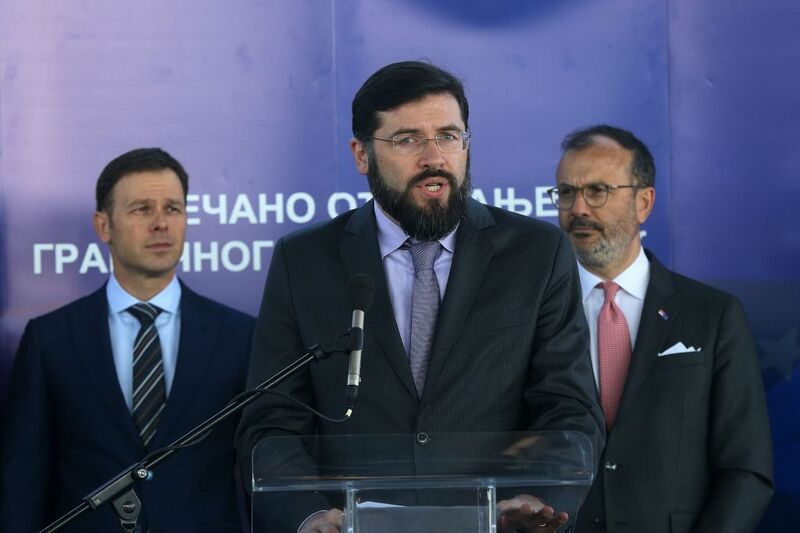 “The project will influence local economy and strengthen the impact in other areas, such as cultural cooperation, tourism, environmental protection and education”, said Budimir. Modernisation of Bajmok crossing will improve the quality of life of the locals and facilitate travelling, as well as the work of the customs authorities and the police. The works were completed in 18 months. Bajmok crossing has been constructed according to the highest standards and it has everything to ensure smooth functioning of passenger traffic and efficient work of border services. Out of the invested EUR 2.1 million, EUR 1.8 million was secured from EU pre-accession funds, while the other EUR 300,000 was secured through national co-financing. In addition, another EUR 240,000 was allocated for the supervision of works. Newly constructed crossing Bajmok is located some 30 kilometres from Subotica, that is, 50 and 30 kilometres from the busiest border crossings in the country, Horgoš and Kelebija respectively, where traffic will now be significantly reduced. The new crossing includes two lanes in each direction, which will speed up traffic with Hungary. This is also the fastest route to Vienna. The Customs Administration has created all necessary conditions for bus traffic at the crossing. As before, there will be no goods traffic. The crossing was opened in 1991.